In this post I talk about how to configure some security options of Apache Web Server. A proper configuration of Apache Web server may extreamely important since it sometimes can prevent certain Web Application Attacks even though the vulnerability is there in the web application. In this post I'll describe how to set configure apache to send Security concerned HTTP headers in its response and hide sensitive information from server response headers. In a later post I'll describe setting virtual hosts with SSL enabled,request rewriting and redirection. These headers are sent by the web server to trigger browser security mechanisms which browsers use to prevent certain Web Application attacks. You can find more information on these headers at this OWASP page. If not configured manually, these headers are not sent by Apache server and hence browser security mechanisms are not activated. X-Frame-Options header is sent by a server to prevent ClickJacking attacks. When this header is set to DENY browser do not let you to display the response inside an Iframe. If this header is not set in the response, browser do not trigger that protection mechanism. So, letting a page to be displayed inside an iframe make the application vulnerable to clickjacking attacks. Another important fact is that most people keep their default configurations left, which in turn reveals some important information about their server to attackers. Have a look at folllowing response. You can clearly see that above response is coming from an Apache web server with version 2.4.7 and you can see its OpenSSL and PHP versions and on which platform its running (in this case Windows) clearly. An enthusiastic attacker can search online for published vulnerabilities and exploits for above server on the given platform and the software installed on the server, if a matching exploit found, he can easily attack your web server. So, these information should never be revealed and should be hidden or obfuscated. 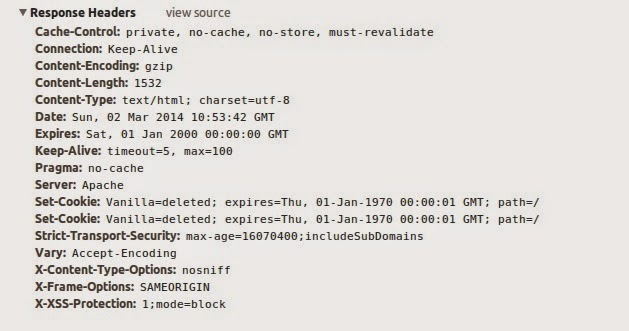 To mask detailed information from Server header, edit Apache's /etc/apache2/apache.conf file. Open the file and add following entries at the end. By changing the parameter of ServerTokens, you can mask information in few levels. Following is possible values for ServerTokens parameter. I can now see that detailed information from the server header are removed and it only displays the server is Apache. And also we need to hide PHP version which is disclosed by X-Powered-By header. To do that, simple include following line inside /etc/apache2/httpd.conf file. This command will remove X-Powered-By header from the response and after restarting apache server you can see there is no more PHP version disclosure in the header. Now we need to server to send Important security headers with the response. You can do this editing very file /etc/apache2/httpd.conf and add following lines. In this case lets consider only above three headers. Upon this configuration and server restart, you'll now see these headers are now set in the server response. These are only few configurations. Put a comment if there's any correction or something to be added.